Editor's note: This article is tied to a report on Yazidi immigrant Murad Ismael and NYC Pastor William Devlin's humanitarian trip to Erbil, Iraq. Read that report here: US Pastor Who Supported Meriam Ibrahim in Sudan Heads to Iraq With Yazidi Activist; Says Christians Can Pray, Give Money But Should Put Their Bodies on the Line. Also, read Ismael's account of the atrocities unfolding in Iraq under the Islamic State here: US Yazidi Returning to Iraq Amid ISIS Persecution Calls for People of All Faiths to Act. NEW YORK — A New York City pastor traveling with a U.S. Yazidi leader to offer humanitarian assistance to religious minorities targeted by the Islamic State in Iraq believes Christians in America should do more to encourage believers living in some of the world's most persecuted countries. The Rev. William Devlin, co-pastor of Infinity Bible Church in the Bronx borough of New York City and a former politician, is as much of an activist as he is a missionary. When the City of New York banned churches and other religious groups in 2011 from renting public schools for worship gatherings, Devlin embarked on a 42-day fast, was arrested in an act of civil disobedience, and publicly confronted then-Mayor Michael Bloomberg during an interfaith breakfast about the city's decision (which the current mayor has vowed to reverse). 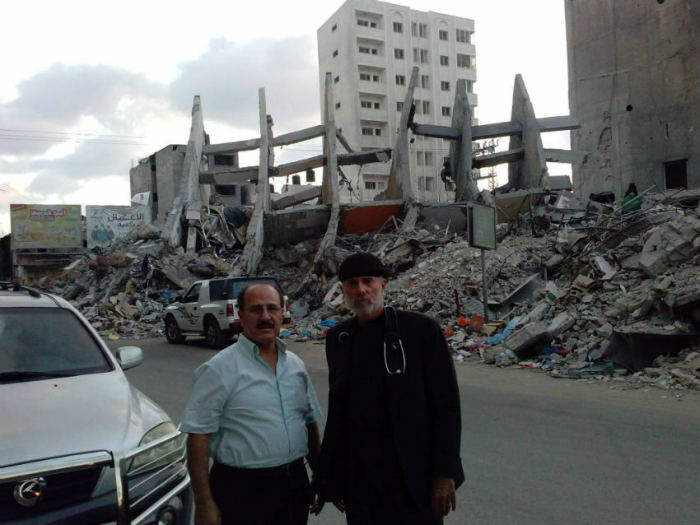 As of late, the 61-year-old evangelical leader has been focused on reaching out to Christians living in persecuted or difficult countries, such as Sudan, the Gaza Strip, the West Bank, Syria, Iran, and Cuba. Devlin was featured in The Christian Post this past summer after visiting with Sudanese Christian Meriam Ibrahim who had been imprisoned for alleged apostasy. Read about that here: NY Pastor Meets Meriam Ibrahim in Sudan, Offers to Help Bring and Take Care of Her Family in US. Devlin traveled to Erbil, Iraq, on Dec. 16, along with Yazidi immigrant Murad Ismael, a 31-year-old research assistant at the University of Houston in Texas. The men met by chance in November. While Ismael's stay was expected to last at least two weeks, Devlin was expected to return to the U.S. after a week in the country. The men have so far met with displaced Yazidis staying at refugee camps in Erbil, according to an update Devlin sent Dec. 19 via email to CP. The New York City pastor wrote that they "heard many...heart-wrenching stories" from survivors of the Islamic State's assaults. The Islamic State of Iraq and the Levant (ISIL or ISIS) has been for months waging a brutal and bloody campaign in parts of Syria and Iraq in an effort to impose a caliphate throughout the Middle East and North Africa. Islamic State militants have been killing en masse any non-Muslims and unsympathetic Muslims who refuse to support the extremist Sunni group's crusade. It has been widely reported how the Islamic State gained control of Mosul and Sinjar in northern Iraq over the summer, killing thousands of people, displacing more than 300,000 others, and forcing many women and young girls into sexual slavery or marriages with IS militants. In addition, as Ismael told CP in a phone interview on Dec. 15, numerous Christian churches and Yazidi temples were destroyed. He called the mass killings of Yazidis an act of "genocide." The religious practices of the predominantly ethnic Kurdish Yazidis have been tied to Zoroastrianism, and reportedly include aspects of Christianity and Islam. Yazidis number anywhere from 600,000 to more than a million worldwide, about 500,000 of them reside in Iraq. Pastor Devlin told CP that in addition to assessing the humanitarian needs of Iraq's displaced minorities, he was anticipating an opportunity to help free Yazidi and Christian women held in captivity by the Islamic State. Ismael, although sharing the same goal, was not quite as optimistic that they would be able to win the women's freedom. Read more of Ismael's remarks on the situation in Iraq: US Yazidi Returning to Iraq Amid ISIS Persecution Calls for People of All Faiths to Act. Below is a transcript of Devlin's phone interview with CP that was conducted on Dec. 15, the day before he departed for Iraq. It has been edited for clarity. CP: How did you and Murad Ismael connect? Well someone in the radio world ... a media personality, heard me on that radio show (with) the rabbi, called me, and said, 'On our radio show, we just had one of the leaders of the Yazidis in the U.S., Murad Ismael.' I said, 'Well can you put us together?' So on Thanksgiving Day, Murad and I spoke. And he said, 'I hear that you have a desire to go to Iraq and help the Yazidis.' I said, 'Yes.' He said, 'Well, let's go.' And I said, 'I'm ready to go.' That's how we got together. It was really me being on (Potasnik's) radio program on Sunday morning. CP: What do you and Ismael hope to accomplish during your trip to Iraq? Devlin: We hope to accomplish two things Murad and I ... We're going to, number one, assess the humanitarian situation over there. I'm bringing over some pharmaceuticals and some medical supplies to Erbil and with us when we leave tomorrow. … Samaritan's Purse sent over a 747 cargo plane back in August and I know some other organizations have flown in supplies to Erbil. The Federal Aviation Administration a couple of weeks ago now has blocked any further airplanes that are registered in America, the FAA is no longer allowing them to fly into Erbil because of the danger. So when we get there we want to assess the situation — what are the needs and then how are things getting in? Then, when I come back, I'm going to talk to Samaritan's Purse, Convoy of Hope, World Vision, Feed the Children, etcetera, you know all humanitarian organizations that are huge that I have relationships with.